27/01/2010 - Before breakfast we had decided that we would stay another night in rotorua so i went down when reception opened and asked if we could stay another that way we wouldnt have to check out and check back in. We had another nicve big breakfast with all the food that linda and keith had given us, then went to the Polynesian Spa we had read about. 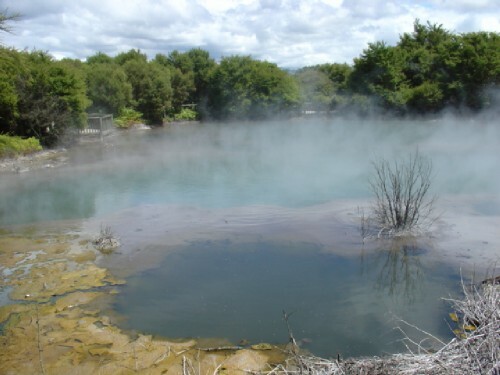 There were 7 different hot pools ranging in temperatures between 38oC to 42oC and it was located right on the lake so it was really nice, but a little smelly to say the least. There was hardly anyone else there which was nice. We only stayed for an hour though as tom didnt like it because he was too hot!! He asked if they had a normal cold pool he could go in! After that we went for a drive around the lake which took about an hour, it was really nice and being in a car we ouldnt stop whenever we wanted and look at the great views. When we got back we went for a walk around the town and had a look int he shops. We chilled in the room for the rest of the afternoon before going to the Maori eving we had booked called Mitai. It was a really good night even though it chucked it down with rain. They put on a show where they showed us some of their dances including the Haka and after that we had dinner which they had cooked in the gorund and it was well yummy, me and tom were both suprised by how nice it was. Then they took us for a walk through the rain forest to see the glow worms in the grass.